On Friday the NYC Department of Transportation and the Smithsonian's Cooper-Hewitt, National Design Museum announced an international design competition for bike parking in New York City. The design competition's website explains that although U-racks, the current model, are functional in many ways, the current design "does not fulfill the potential to be an icon for New York City cycling." They are soliciting a new design that will become the standard for sidewalk bike racks and racks inside buildings and garages. The City plans to add at least 500 bike racks per year to the existing stock of approximately 4,000 bike racks. Your design could be the new model. The international competition will be juried by a panel of experts from the worlds of industrial design, art and transportation. 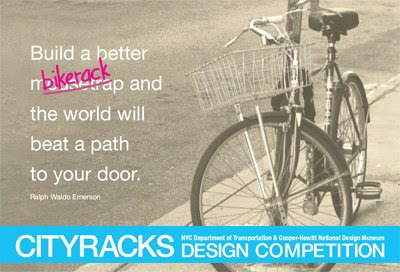 Find out more and register at City Racks Design Competition.